Lua error in Module:Location_map at line 488: Unable to find the specified location map definition: "Module:Location map/data/United States Washington, D.C. central" does not exist. West End of National Mall, Washington, D.C. 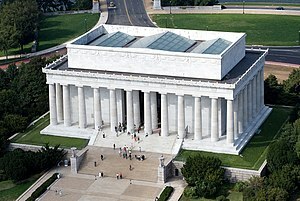 The Lincoln Memorial was built to remember Abraham Lincoln. Lincoln was the 16th President of the United States. He led the nation during the American Civil War. The memorial is in the National Mall in Washington, D.C., and is a popular site for tourists. The Lincoln Memorial was built to look like the Temple of Zeus at Olympia, Greece. The main focus of the memorial is Daniel Chester French's sculpture of Lincoln, seated on a throne.It is surrounded by thirty six columns which are 37 feet (11 m) high. There is a large reflecting pool right outside the steps. A sculpture of Lincoln sitting on a chair is inside the Memorial. The statue shows the President looking towards the reflecting pool and the Washington Monument. The statue is 19 feet 9 inches (6 m) tall and 19 feet (6 m) wide, and was carved from 28 blocks of white marble. This is a complicated sentence and was written long ago. It means that Abraham Lincoln will forever be remembered here, just like he will be remembered by the people of the United States, who he saved. Lincoln's famous speech, the Gettysburg Address, is written into one of the walls at the Memorial. There are also several murals on the other walls. One of the murals shows an angel, and another one shows a slave being freed. Due to Lincoln being associated with freeing the slaves, the Memorial has been a center for civil rights protests in the United States. In 1939, Marian Anderson sang there because she could not sing at Constitution Hall. The Memorial has been used many times for famous events. Martin Luther King's I Have a Dream speech was given on the steps of the Lincoln Memorial. President Richard Nixon once met with protesters of the Vietnam War, who were at the Memorial. A concert was given for President Barack Obama at the Memorial before he took office. The Lincoln Memorial has been on the back of the United States penny (the one cent coin) for many years, as well as the five dollar bill. Both have a picture of Lincoln on the front. ↑ 1.0 1.1 "National Register Information System". National Register of Historic Places. National Park Service. 2007-01-23. Wikimedia Commons has media related to Lincoln Memorial. 20th century establishments in Washington, D.C. This page was last changed on 16 July 2018, at 10:34.